Three regional dailies failed to make it onto the newsstands today while NCTJ seniors’ exams were cancelled as the UK continued to be gripped by adverse weather. Trinity Mirror apologised after iot was unable to distribute its daily titles the Western Mail, South Wales Echo and South Wales Evening Post in South Wales this morning due to extensive transport disruption caused by heavy snow. The Echo and Evening Post are focused on Cardiff and Swansea respectively, while the Mail is available across Wales. The announcement regarding the three titles’ availability was made on the official Twitter channel of TM’s Wales Online website this morning. An image of the Echo’s front page today. The image was posted on Twitter after the actual front page failed to make the newsstands. 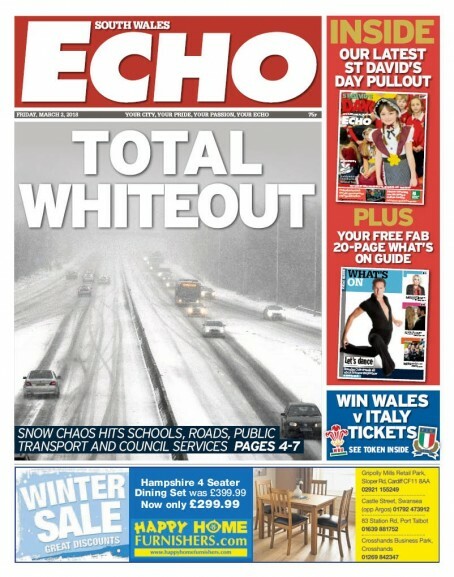 It stated: “We’re extremely disappointed to report that because of the extensive transport disruption caused by the heavy snow, we have been unable to distribute the Western Mail, South Wales Echo or South Wales Evening Post in South Wales today. The titles were printed in South Wales until 2016 when TM closed its Cardiff print plant, leaving the company with five remaining print centres at Birmingham, Watford, Teesside, Oldham and Cardonald. HTFP has apporoachedTrinity Mirror for further comment. Meanwhile journalists who had been due to sit their senior exams today have also been affected by the weather. The National Council for the Training of Journalists announced this morning that some centres where candidates had been due to take National Qualification in Journalism tests today were closed. In a statement, the NCTJ said: “Due to adverse weather conditions, a small number of exam centres have been unable to open today affecting the opportunity for some candidates to sit the National Qualification in Journalism examinations. “We are pleased that the majority of centres are open as usual and would like to thank everyone who has travelled to our centres in difficult conditions – exam candidates, centre staff and volunteer assessors and interviewees. “All candidates who have been affected by centre closures have been notified and we are grateful for their understanding and willingness to be transferred to the next NQJ.